Your guide to recommended restaurants & gastropubs in the English Lake District. 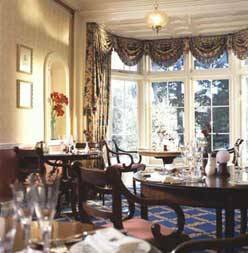 The Lake District now has many restaurants which among the best anywhere in England, and you can choose from a huge range of styles and prices. We offer a selection of the ones we've especially enjoyed; and, as always, we'd be delighted to hear from you if own a restaurant you'd like included here, or you've visited a Lakes restaurant which is worthy of inclusion. The criteria for inclusion here aren't just about price - they're much more about quality and value for money, so feel free to submit any of your favourite restaurants, whatever and wherever they may be. We'll check them out in person before we list the review here. And if you want to see if a particular Lake District restaurant is your kind of place, why not check it out by phone or on the internet before you go? Finally - what is a "gastropub"? Well, our definition is this: a high class pub with a relaxed, pleasant environment that offers refined cooking more characteristic of a good (or even a great) restaurant than a traditional pub. And don't forget to look at the pubs section for many other recommended places to eat! Ulverston is a little market town on the road from Newby Bridge to Barrow. It's not necessarily a place you'd expect to find a restaurant of the quality of Rustique - but then, restaurants of such outstanding quality appear to be spreading all over England these days! Suffice it to say that Rustique is one of that modern breed of restaurant that fuses all the elements of great cooking - skill, flair, imagination, craftsmanship - with selection of excellent ingredients, a wonderful ambience, and attentive but informal service. Highly recommended. From the same stable as the Drunken Duck (see below), this is an excellent modern gastropub serving all the specialised and inventive dishes you'd expect. Highly recommended. This pub is the epitome of the gastropub, serving the highest quality cuisine in the most delightful setting. There are even bedrooms upstairs to stagger back to when you've sampled the pub's own home brewed beer and the fine food on offer in the charming dining rooms. We've eaten there many times and never been disappointed! You'll be able to try traditional food with a twist and things you'd never find anywhere else (like the scrumptious pigeon with liquorice). 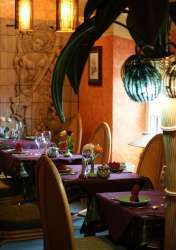 Vegetarians are well catered for with many delicious options on the menu. However, the prices are a bit steep: £17.95 for 3 scallops sitting on a little bean salad, however delicious, is a trifle ridiculous. The Drunken Duck, Barngates, 3 miles from Ambleside. Follow the B5286 to Hawkshead and watch for the direction sign. A restaurant run by people who care about what they do. Unpretentious, but gaining uniformly excellent reviews, Jericho's provides well-crafted, imaginative and high quality meals in a delightful setting, including a great veggie option. Dinner only. It's pricey, but well worth it. A special two course Early Evening Menu is available daily between 5pm-6pm @ £11.95. Most items on our menu are also available for Takeaway. Outstanding Chinese restaurants are a bit thin on the ground. This one comes recommended by its many regular visitors. Rothay Manor is renowned for excellent food and wine and has a reputation stretching back through 40 years' ownership by the Nixon family. It continues to go from strength to strength and has been listed in the Good Food Guide consistently for 38 years. Part of this success is down to consistency, for head chef Jane Binns has been at the hotel for 30 years. In that time she has built up a network of local suppliers from whom she sources fresh produce of the highest quality. The comfortable lounges and classical-style dining room create the perfect environment to turn any meal into a special occasion. Almost an Ambleside legend - it's been there for 15 years, and over that time it's never lost its high standards and its interesting approach to fresh food. And guess what? It's all veggie, though you might never notice! Booking is advisable for the evenings, because they do a great trade in combined cinema and dinner reservations which eats up the tables in the early evening. Zefferelli's, Compston Road, Ambleside (on left of one-way street coming into town centre from Windermere). A very jolly little place with a tempting range of delicious dishes from around the world with a local touch - try the Herdwick lamb kofta, for example! The proprietors make it relaxed and welcoming, and they've succeeded in producing a fairly sophisticated eating house with a varied menu, an extensive wine and beer list, and a touch of the exotic. An upmarket bistro, specialising in pastas and pizzas with some more sophisticated main courses such as monkfish wrapped in pancetta and roast lamb on olive oil mash. To quote one customer: "A fabulous restaurant. Highly recommended. 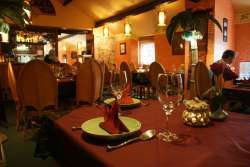 We went there 2 evenings running - on both occasions the service and food could not have been any better." A Tapas bar and restaurant where you can enjoy charcoal grills, both meat and fish.